On behalf of the cclib development team (namely Karol Langner and Adam Tenderholt who did all the work), I am pleased to announce the release of cclib 1.2, which is now available for download. This version marks the first stable release to target Python 3, and includes several new features and bug fixes (see below). cclib is an open source library, written in Python, for parsing and interpreting the results of computational chemistry packages. It currently parses output files from ADF, Firefly, GAMESS (US), GAMESS-UK, Gaussian, Jaguar, Molpro and ORCA. For information on how to use cclib, see the tutorial. If you need help, find a bug, want new features or have any questions, please send an email to our mailing list. Something that's really useful is syntax checking. It can save a lot of time (not to mention frustration) if you can find errors *before* you run your scripts. The Syntastic plugin for vim can be used for this. As far as I can tell, it doesn't do any syntax checking itself, but rather is the glue that links other syntax checkers to vim. First things first, to simplify matters (*), let's rename _gvimrc to .vimrc (easier to use the commandline for this). 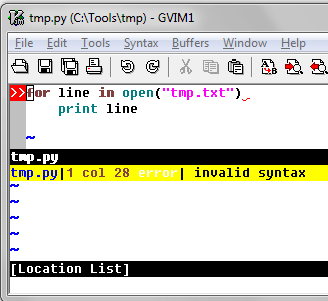 c. Test by opening a file in gvim, and checking for error messages after typing ":Helptags"
Next, let's say we want to add some syntax checkers for Python. Your choices are pyflakes, pylint, flakes8 and Python itself. It's not either/or - you can include as many as you want. Note that flakes8 is a combination of pyflakes, pep8 (PEP8 style checker), and McCabe (cyclomatic complexity checker). I'm not so keen on style checkers and so I'm going to go just with pyflakes and Python. 4. Open a Python file and check that pyflakes and python are listed when you type ":SyntasticInfo"
The screenshot at the top of the post shows the plugin in action. It's triggered every time you save a file. * This is necessary because the call to pathogen#infect() is ignored if in _gvimrc (I don't know why). If instead we used _vimrc, then the _vimrc installed in C:\Program Files (x86)\_vimrc is ignored (and we miss CTRL+C/V behaviour for example). This leaves us with .vimrc.